Another graduation season has passed. In many shops, that means a fresh influx of new graduates from high school, trade school, and community college. If you have openings due to retirement or growth, there’s a good chance you’re filling those jobs with younger workers. Whether they’re aware of it or not, today’s graduates are part of a generation that is fundamentally changing the nature of work across the country. They’re the Millennials, generally described as workers born sometime between the mid-1980s and the late-1990s. The Millennials grew up with access to computers, video games, and the internet. The younger members of the generation, those just now graduating from high school and trade school, can’t remember life without social media, smartphones, and Google. Those experiences have shaped how they approach work. Very soon, Millennials will make up a large part of your workforce. By 2025, Millennials are expected to account for 75 percent of the workforce. 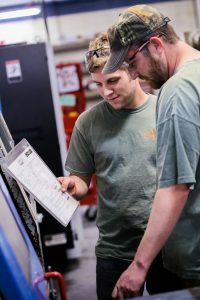 As your older workers retire and you transition in the next generation, you will likely see a growing number of Millennials enter your shop. Keep the lines of communication open, and listen to their input. A Gallup study from 2014 found that only 28.9 percent of Millennials are engaged with their job. That means a whopping 71 percent are actively disengaged. You likely know firsthand what happens when an employee isn’t engaged. Their work and efficiency suffers and they may even be on their way out the door. There are a couple of strategies you can implement to improve engagement, not only among Millennials but with all employees. One is to communicate regularly with your employees. Hold meetings where you listen to them as much as they listen to you. Communicate in group settings and one-on-one. Employees are always more engaged when their voice is heard. Second, take their input seriously. Give employees opportunities to work on improving the shop, from recommending process improvements to organizing team building activities. Their input is valuable. If you recognize the value of their input and take their feedback seriously, they’ll be more engaged with the company and the work they’re doing. Give them ownership over projects. Entrepreneurship is a big idea in the world of Millennials. They’ve grown up in the era of the startup. Their icons are people like Mark Zuckerberg, who launched a multi-billion dollar company out of his dorm room. According to a study from the Intelligence Group, 72 percent of Millennials want to be their own boss. Granted, entrepreneurship may not seem to be consistent with working in a shop. However, you can still appeal to and tap into your workers’ entrepreneurial spirit in a way that keeps them engaged and helps you make improvements in your business. One way to do it is through something called intrapreneurship. Simply put, intrapreneurship is a strategy in which you give an employee or a small group of employees complete control over a specific project or process. For example, you may put one team member in charge of implementing your new shop software. Or you may designate a team to come up with recommendations for speeding up your manufacturing time. The key is to align workers with their interests. Give them a chance to lead in an area that suits their skills and goals. Also, be sure to give them ownership. If you micromanage the project, you undermine the entire point of the exercise. If you’re like most shops, you are on a standard schedule that probably involves two or three set shifts. That’s what many shops have used for decades, and it’s worked well in the past. However, Millennials have their own expectations about scheduling and how work integrates into their life. According to the Intelligence Group, 74 percent want flexible schedules and 88 percent want their work and life to integrate effectively. If you think that’s unreasonable, consider how Millennials have grown up. They’ve had the flexibility to do their homework on a laptop in a coffee shop, the park, or wherever else they see fit. Many may have had flexible schooling schedules and may have even taken classes online from home. Obviously, your work has to get done and it probably has to be completed in the shop. You can’t let your shop floor members work from home. However, you can rethink the traditional shift you have set up. Maybe you could allow employees to choose between working five 8-hour shifts or four 10-hour shifts. Perhaps you could let small employee teams set their own group schedule, allowing them to better coordinate around personal commitments. Maybe you could loosen up your rules about paid time off and family leave. You may not be able to let employees work from home, but you can be creative with your scheduling rules. Think about ways to make your schedule more flexible and more accommodating of personal life. The Millennials are coming, and with them comes a new mindset about work and how shops should operate. If you embrace Millennials and appeal to their needs, they could be a powerful force to drive your company’s growth. If not, you may struggle to attract and retain the best skilled workers in the coming years.